As Managing Director at United Europe since February 2016, Jenny Paul is in charge of the initiative’s finances, logistics and IT. 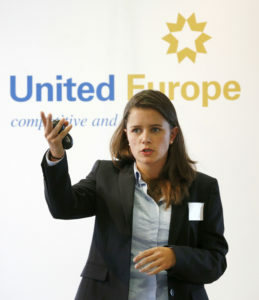 In addition, she focuses on developing United Europe’s profile and expanding its network of young professionals. Jenny Paul joined United Europe as Project Director in October 2015. Paul has a background in strategic management and worked as a project and programme lead for several organisations and industries in Germany and the UK. Before joining United Europe, she worked for the UK Civil Aviation Authority (UK CAA) together with international partners including the European Aviation Safety Agency (EASA) to increase global aviation safety. Next to her passion for Europe, Paul also enjoys team sports of all kind and is an enthusiastic debater, most recently for the Brighton & Hove Debating society. She studied Business Administration with a focus on strategic management at the universities for applied sciences and management in Munich and Erding.